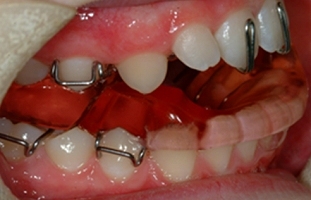 This type of appliance works on both the top teeth and lower teeth at the same time. It will reduce a prominent over-jet and is worn for 9-12 months. Further treatment with a fixed appliance may be required after this period. It used to be thought that this type of appliance acted by “growing” the jaw, but studies have shown that this is not the case and it acts by tipping the teeth forward or back whist the jaws are going through a natural growth phase.